Sun shines bright on Beijing at last -- a perfect day for pure sport, beckoning all to party (and spend) within the Forbidden City. A week into the Olympics, and China finally got its first official "blue day" -- of many more promised, including the dubious target of 250 a year. Never mind conflicting readings of particulate matter in the air. Forget the competition over whose skies are clearer, parks greener, young volunteers cheerier. The "heavens are smiling on this great nation," as director Zhang Yimou declared after a rainless Opening Ceremony. The sun is breaking out all over town, the better to see the gleam in Beijing's daring collection of glassed-over architecture, the better to see the shine in China's gold medals. All is right with the world, for as long as the world lasts, and I've even had a stroke of Olympic luck. My random morning baseball ticket is getting me into the premiere quadrennial confrontation: Cuba versus the U.S. I can feel the buzz, and hear the rumba beat of Cuban fans, as soon as I get out of the subway a half-mile from the temporary ballpark whose grandstands rise above jungles of scaffolding. Less attended, but taking place simultaneously on a second diamond, is a ballgame with more potential import, though far less dancing in the stands. That's the fledgling nine from China taking on their more baseball-savvy Taiwanese brethren. Some fans even try to watch both games at once from the top rows in right field. And China's novices will battle to a win in 12 innings. Back in March, I had come to this same field to witness the first U.S. Major League exhibitions in China, between the Padres and the messianic Dodgers -- accompanied by much hoopla and hand wringing at how late our national pastime has been in following the lead of the NBA. (Basketball is clearly China's No. 1 sporting love, with football and golf rising to challenge, and the Olympic match between Yao Ming and U.S. superstars like the beloved "Ke-bi" -- Chinese for Kobe Bryant -- was one event the hoop-enthralled locals didn't mind losing.) Far-fetched as it seems, our archaic game has already been well implanted here, through a school program with 300,000 participants, fed by nostalgia from the '30s and a lust for anything new and foreign. 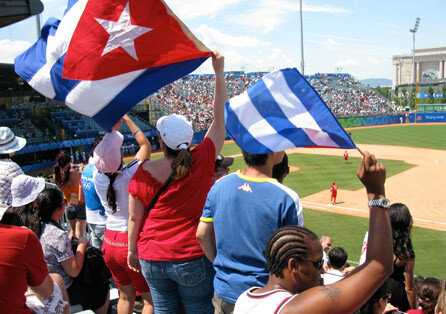 But on this day, it's the Cubans who coach the Chinese -- not so much about baseball's ground rules as its passions. There are estimated to be only 300 Cubans in China, from embassy staff to popular hotel entertainers, and life in so regimented a place is "a very hard weight," one singer tells me. Yet all of them seem to have shown up today, shaking their short shorts, waving their banderas, razzing the umps in their high-speed Spanish. There ought to be a law against people having so much fun in public and there probably is in China, but there's no more way to enforce it today than there is to get the Cubans to "sit down in front," as disgruntled Chinese urge. What could be better than a tie game going into the 9th, between a bunch of gum-chewing American collegians and some blasé Cuban old-timers in funkily baggy pants and fittingly red uniforms that make them look like spike-wearing roosters? And all in the sunshine! The Chinese ladies don't bask in it, because a tan is the last thing they want. Unfortunately, I'm headed indoors to catch the last hour of a long procession of four-round flyweight boxing preliminaries. Back at the L.A. Olympics in 1984, the sport had been lent glamour by the ringside appearance of Sylvester Stallone and other on-screen pugilists. In Beijing, the venue is China's grimiest old gym. And everything seems listless until the last fight of the day features an unknown Chinese entry. Suddenly, the stadium rungs swell with the cry of the moment: "Jia-you!" Literally, this "Go China!" means "Put in the gas." The cries are silenced in the first 10 seconds when a stocky Kazak puts the local favorite on the canvas. This tall gawky kid doesn't even put his gloves up to protect his face and bounces about in over-exaggeration like Chaplin's mock fighter in "City Lights." But sure enough, his point totals rise inexorably toward victory, though much of his scoring comes after inconclusive clinches. It all seems quite fishy, but I figure I must not understand the technicalities. Later, I'll read that the judging for this fight, and others involving Chinese, are creating the first serious controversy of the games, with many complaining that there seems to be a decided home-court advantage. Everywhere I go, in fact, Beijing is awash with whispers about why various tallies in China's mounting medal count could be tainted. Smaller Asian neighbors, it's said, have "stepped aside" to let China win in exchange for future favors. To Dr. Alceste Maurizio Lo Buono, general secretary of the Mediterranean Weightlifting Foundation, it's all very simple: "In Italy, we have 500 active weightlifters. In China, they have 1 million. So they can pick and choose, and they train from age 6, not 16, until they are more machines than men." He's telling me this to predict the ultimate triumph of a frizzy-haired Schwarzenegger named Lu Yong at my first weightlifting final. Oddly enough, I find pumping iron to be one of the most consistently compelling sports of the games: pure human will against more pure matter, and may the best behemoth win. This time the Chinese challenger, with an utterly rabid crowd urging him on, surpasses reigning world champ Andrei Rybakou from Belarus, even overcomes a technicality when he has to redo his lift after thinking he has already won gold. And he does it, sending the crowd into a frenzy, which includes one elderly man nearly shoving me to the ground, twice, so he can get a telephoto shot. Is it really within Olympic rules for all those sweet volunteers who man the metal detectors and usher us to our seats to reappear, on cue, as cheerleaders for each section, mechanically urging total rapture from the crowds? When the Olympic Torch when through Thailand, I had seen mobs of Chinese students threatening the few pro-Tibet protestors with unbridled, semi-violent scorn (imbued since birth, as Chinese are, to consider any supporter of the Dalai Lama as an enemy of the nation's sovereignty). So far the nationalism in Beijing hasn't seemed so threatening to me, except when I turn on any of the many channels of China Central Television, which focuses exclusively on China's winners, day and night, to the exclusion of everyone else, in so single-handed an appeal to their viewership as to make NBC execs envious. But here, at my first gold medal ceremony, with the whole crowd wailing out a national anthem they once saw little use for, I feel like a very small and weak foreigner, unable to lift the load of this new history from my back. Maybe that's all sour grapes from a falling superpower. Maybe it's OK if new rivalries emerge, sporting or otherwise, to replace tired ones. And maybe all the fuss about bad air, and the purposeful underestimation of pollution by local agencies, is so much clinging to Western superiority. After all, the Organizing Committee members I interviewed on past trips have always been quick to point out that Beijing is the most "underdeveloped" place ever to get the games (Mexico City might disagree) and that sewage treatment, waste management, recycling, green cover, secondary pollution from construction, encroaching desertification were all issues that had to be addressed from scratch. The only difference with the air is that it's plain for everyone to see, and that the Chinese themselves promised too much in terms of controlling the vagaries of nature -- trying to get away with starting the games on the auspicious 8/8 date ("eight" in Chinese sounds just like "prosperity") when everyone knows summers here are hazy, muggy, nasty, best suited for the usual outdoor pursuits of old men playing Go on park benches and head-shaven babes wandering in traditional open-crotch pj's. Still, today was a perfect day for pure sport and tonight a full moon shines on Beijing, beckoning all to party (and spend) within the Forbidden City. As for world peace and Olympic fair play, the forecast is ... cloudy. John Krich has been covering China for 20 years, most recently as the Asian Wall St Journal's main food/sports/culture writer. He's the author of "El Beisbol," "Won Ton Lust" and other literary travelogues.